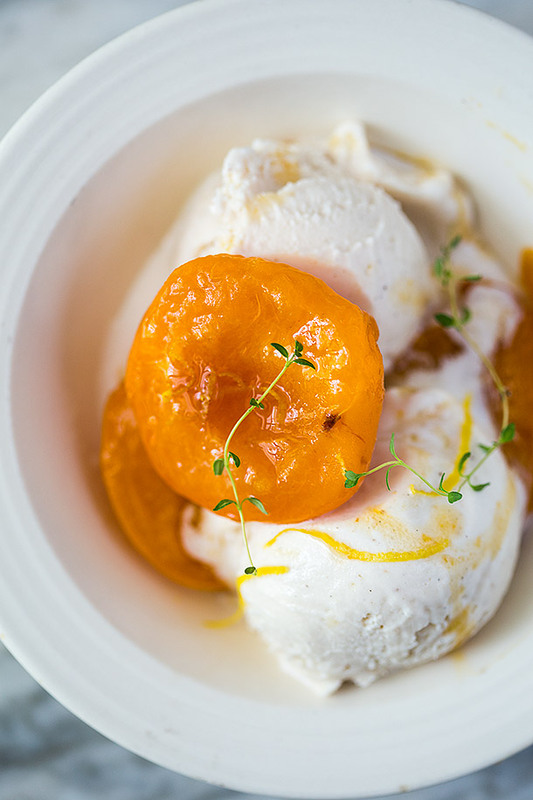 If you’ve never had poached apricots then I feel really sorry for you. You’ve never truly enjoyed an apricot until you’ve poached it. 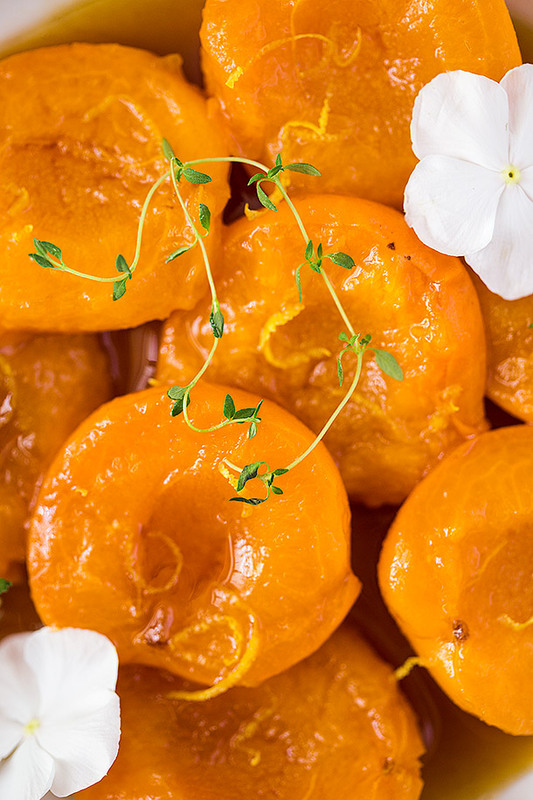 The magic behind this method is not only softening up the apricots a bit but once you’ve poached them you can then reduce the poaching liquid into a delicious fruity syrup to coat your apricots. It’s the next best thing right behind cookies and unicorns; for eating fruit that is. Now that I live moderately close to a whole foods I have found myself frequenting them a bit more often. When I say I bit I mean it’s actually a huge problem, maybe every other day. Mainly because we were slightly out of sorts for a bit after the move so we had to make several last minute trips to the store. Luckily one of these last minute trips was not in vain because I stumbled upon a beautiful basket of gorgeous apricots. When poaching these I decided to do something slightly out of the box. Instead of poaching them in water like most classic recipe I poached them in Rooibos tea, honey, and some fresh thyme. It’s earthy vanilla flavor of Rooibos pairs wonderfully with the sweet and slightly tart apricots. The thyme adds an herby lift to the whole flavor of the dish. That and I just like adding thyme to sweet things because it’s fantastic for all uses. Now when it comes to serving this I previously mentioned serving it over your ice cream of choice. My choice would be vanilla bean ice cream or even hazelnut ice cream, really anything that is more neutral in flavor is best. Now that doesn’t mean you’re locked into serving it with ice cream, it’s also absolutely delicious with yogurt. You could even garnish that with fresh chopped nuts for some crunch. I’ve also seen a lot of recipes that use mascarpone which I have not tried yet but I will be trying that soon because it sounds fantastic. Heat water until steamy hot either in a pot or in the microwave and add the tea bags. Let steep for about 3 minutes then remove and discard the tea bags. 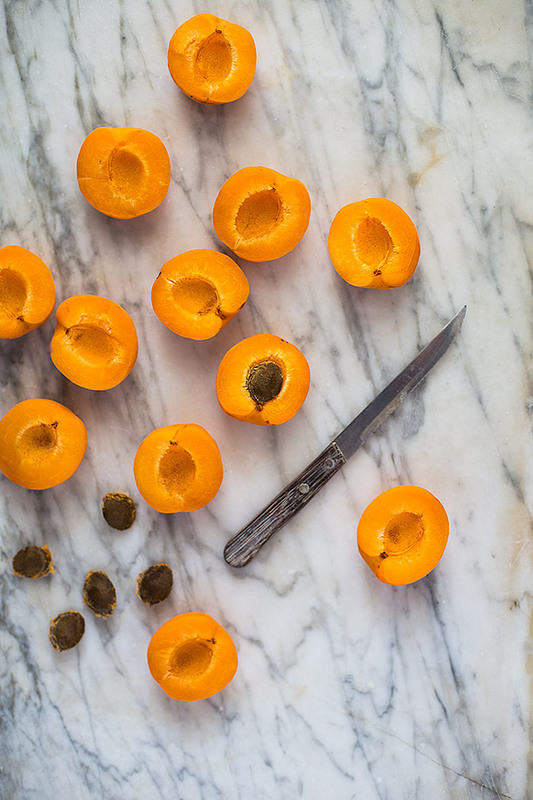 Slice each of your apricots in half and remove the seed in the center. If they don't easily open then slice them all the way around twist and open them, like an avocado. In a medium sized sauce pan bring the tea to a boil then whisk in the honey. Once it's boiling and the honey is entirely incorporated add the cardamom pods. Place your apricot halves cut side down in the boiling tea in a single layer so that none are on top of each other and each are touching the bottom of the pan. Reduce the heat to a simmer, add the thyme sprigs, and simmer for 3-6 minutes depending on how ripe your apricots are. The more ripe the less time you need to simmer them. You want them soft but not falling apart. 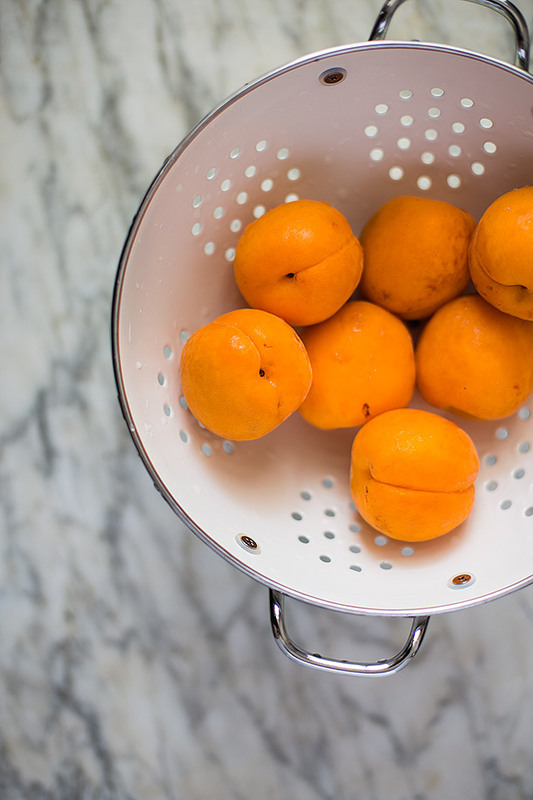 Remove the apricots with a slotted spoon and place them in a bowl to serve. Increase the heat on the poaching liquid and boil it, stirring often, until it's reduce by about half and has a syrup consistency. 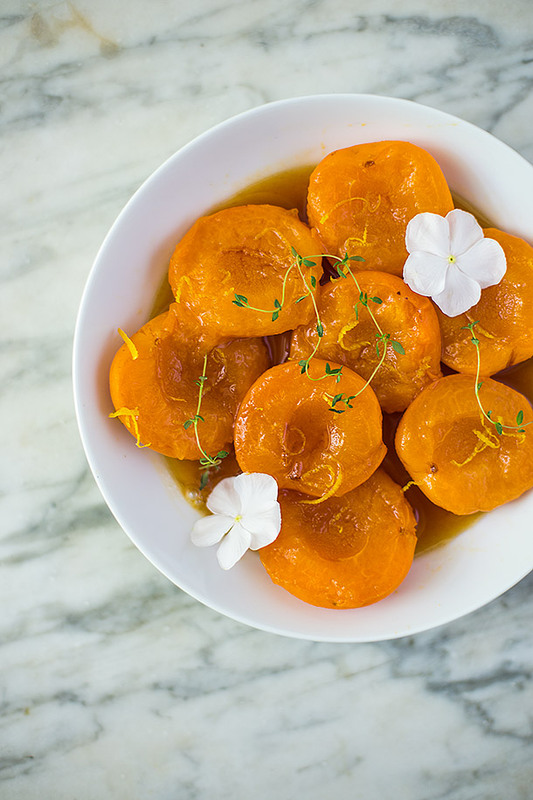 Pour the syrup over your poached apricots and serve with a little bit of the syrup drizzled over each individual serving. Serve by themselves or with ice cream, full fat yogurt, or mascarpone. This sounds absolutely divine and I can’t wait to try it. That looks scrumptious, Josh. I want some right now! Wish I hadn’t eaten all but one of my apricots… Darn. I’ll definitely have to go get more! Sounds delicious, pity its winter here in Australia, I’ll have to wait until summer for apricots !! I don’t eat ice cream much these days, but this would make a wonderful treat for a special occasion.